Every Moroccan lunch or dinner starts with “mezze”, which can loosely be described as a salad course. The typical mezze that we have been served ranges from six to eight separate items served cold as a first course, all fresh and all delicious. We have had carrots prepared with any number of different spice combinations (our favorite was a cinnamon mixture). We have many eggplant variants, fava beans, beets, peppers, and many other interesting and tasty combinations. 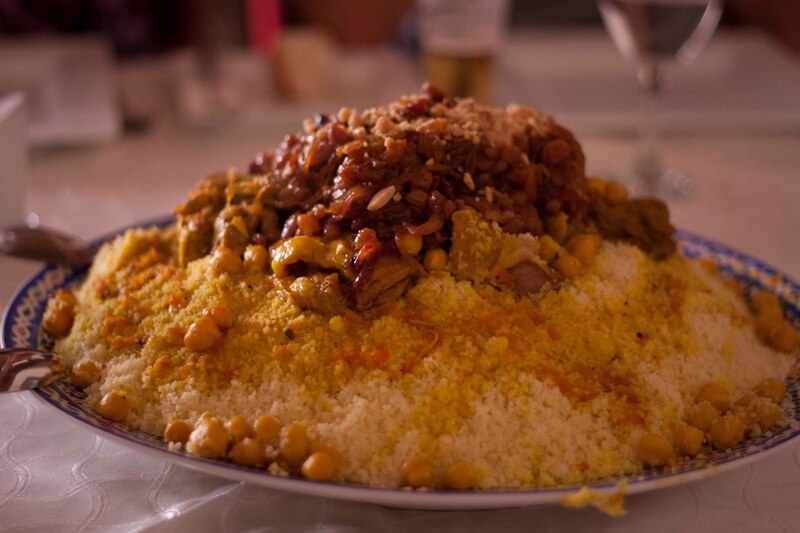 This course is followed – frequently – by two meat courses, one with couscous followed by an “en brochette” of some sort (grilled meats on skewers). Our favorite meal so far, pictured here, was veal shanks over couscous mixed with raisins and prunes, followed by skewers of beef and chicken served with “green rice” (rice mixed with parsley and other herbs). This was preceded by the traditional “mezze” of eight small dishes. Dessert is typically an enormous bowl of oranges, apples, and bananas, and this is followed by the ubiquitous Moroccan mint tea, a tiny glass with mint leaves on the bottom, on top of which is poured a heavily sugared green or black tea. Since the country was ruled by France for almost fifty years, many of the meals have a French accent. Breakfasts always include café au lait and croissants, in addition to fruit and various other Moroccan items. Our favorite breakfast item so far is a small pancake-like flatbread freshly baked and served warm, over which is drizzled honey, then topped with fresh goat’s milk cheese and strawberries or other fruit. And of course in the most humble truck stop in any out of the way part of the country one can find superb café noir, which is better than 90% of the coffee served anywhere in America. Virtually every truck stop has a commercial-grade espresso machine, and the know-how to make and serve it. Prev One World, or DisneyWorld?